If you have a lot of programs open and you want — or need — to close them all at once, we normally have to go through the laborious process of closeing each program one by one. And that takes time. The more programs you have open the more time it takes. Wouldn’t it be nice if there was a free program to close all your programs at once – or let you choose which programs to close and which to leave running? And did you know that closing all open programs can speed up your Widnows shutdown? CloseAll is a small enhancement utility for Windows that flashes a ‘close’ signal to all open applications and then ceases. It doesn’t use any system resources and unloads right after completing its task…. …What can be easier than a task list with check boxes and OK button? Just select apps you want to close and click “Close All”. 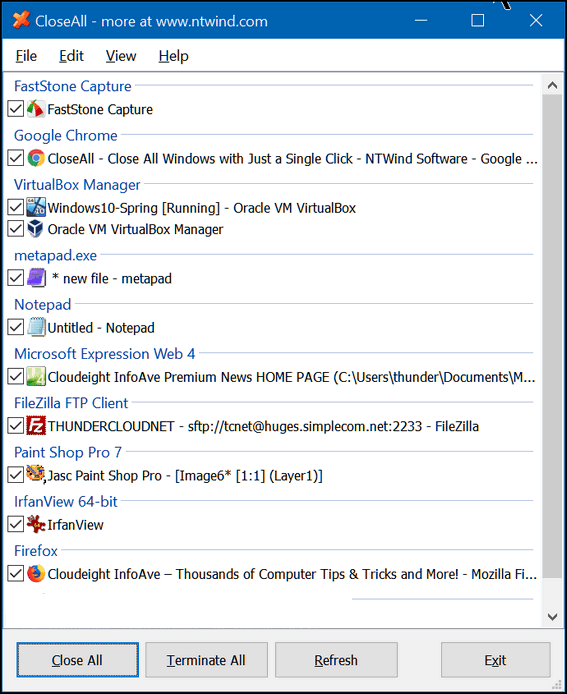 CloseAll works on Windows 7, Windows 8.1, Windows 10 (all versions). It works on 32-bit and 64-bit systems. Sound like a program you could use? You can get it free from here. We tested the program on 14 May 2018 and found it works as described and is free from any malware and does not attempt to install any other software. What do you think is the best free and simple video editor? We don’t use any video editors on our Windows computers.. sorry… Maybe one of our readers has a suggestion for you. Anyone reading this, do you have any ideas for Albert? What is the difference between Close All and Terminate All? I read all the instructions that I could find and it didn’t specify anything about the Terminate All. For our purposes Close, Terminate, and End all mean the same thing when it comes to programs. Programs are processes or task. End Task, Terminate Task and Close task all mean the same thing. Terminate isn’t a term you’d use for program Windows – most people would say “close” a window.. not terminate one, although you could say terminate a window if you really want to be a sesquipedalian. We are not getting technical in the article – CloseAll terminates any running programs you want to terminate and closes and closes all open Windows. It all that complex. It’s a very simple and straight forward program.